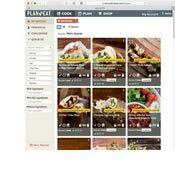 If you already have an account with the Plan to Eat website, log into your account in the app and all of your recipes and meal plans will be waiting for you. If you’re new to Plan to Eat, welcome! Simply create an account in the app and let’s get started! by copying the URL, navigating back to the Plan to Eat app, and selecting the Import recipe from the web option. Paste the URL into the import box and the recipe will be brought into your Plan to Eat account. Recipes can also be entered manually by using the Add a recipe by hand feature. Add or change any recipe image by taking a new photo or selecting a photo from your library. Search for recipes with keywords that match the title, description, ingredients, directions, source, or tags. If you navigate to your planner or shopping list, then come back to your recipes, your found recipes will be waiting for you. Click the 3-dot menu on the recipe you would like to plan and select “Add to planner” to bring up the meal planning calendar. Select the day and the meal, then press add. You’ll see a note confirming when you planned the recipe. 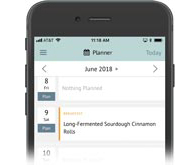 You can also plan a recipe directly on the planner by pressing the date, then selecting one or more recipes, and a meal time. 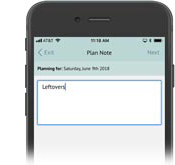 Selecting a planned recipe will give you the option to reschedule, duplicate, or remove that recipe from your meal planner. Adding Notes to your meal planner can be a helpful way to indicate something special about a certain day. This can be things like “leftovers” or “eating out”. Notes will not affect your shopping list. Ingredients that are added to your meal planner will appear on your shopping list as an item. This can be simple things that aren’t recipes and usually accompany a meal like “bananas” or “orange juice”. Each recipe has a serving size which can be scaled up or down depending on the size of your household. As you make adjustments, the quantity of ingredients will be scaled up or down accordingly. When you add this recipe to your planner, Plan to Eat will assume that you are cooking for that number of servings. Once a recipe is on your planner, you can also scale it up or down by selecting the recipe and editing the planned servings. This will alter the quantities of this recipe for this one time on your planner, but will not alter the original recipe. This is useful for situations such as cooking for additional dinner guests. The Cooking View is an easy way to view your recipes while in the kitchen. The overview will list your instructions in a scrollable list, while the step-by-step instructions will show them one at a time. Simply scroll through the recipe as you are cooking and follow along with the instructions. 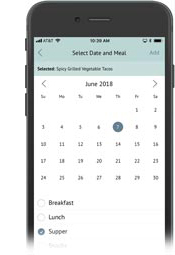 With your recipes on your planner your shopping list will be made for you automatically by selecting a range of dates that you would like to shop for. The ingredients from any planned recipe that falls within those dates will be added to your list. Items can be checked off of your list as you shop. Pressing the pencil icon to the right of the item will show the details of that item, including what recipe it’s in and the date of when it’s planned. Your shopping list can be customized to list any stores where you like to shop, and any categories within those stores. 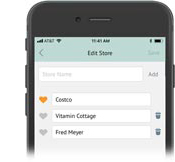 Press the 3 dot menu at the top of your shopping list to customize your stores or categories. 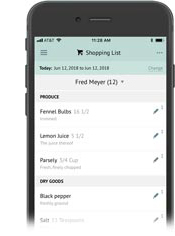 Shopping list items can be manually added to your list by pressing the Add New Item button at the bottom of the shopping list and filling in the item information. As you use Plan to Eat more and more, the store and category will be filled in for you based on the store and category you used the last time you purchased this item. If you are adding multiple manual items to your list, while typing in the first item select the store that you are heading to and all subsequent list items will also be added to that store. This makes it easy to quickly add multiple items in one store or category. The Staples List is the place to store items that you purchase frequently and want to remember, but will not show up in your shopping list because they aren’t ingredients in recipes. Your Staples List is found by tapping the "Shopping List" header. It can be customized to anything you like, but typically includes things like trash bags, paper towels, or shampoo. Before heading to the store, take a quick look through your Staples List to add any item you might otherwise forget to add to your shopping list. Your recipes, meal planner, and current shopping list are available on your app, even when you’re not connected to the internet! Downloading those items while connected will save them on your phone and give you access to them regardless of where you are going. 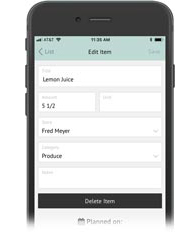 You can add, edit and view your recipes, alter your meal plan, and manually add, edit and check items off of your shopping list without being connected to the internet. All of your changes will be synced and available on other devices as soon as you are connected to the internet again. *Checking items off of your shopping list will work offline, but changing the date range of your shopping list requires an internet connection. 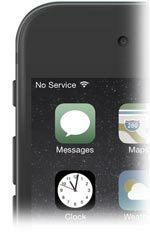 Please remember to load your list before heading to the store if you know you will be without a connection. The Plan to Eat app and website work together. As you make changes in the app, our website will be updated as well — simply refresh your browser or navigate to a new page to see updates. 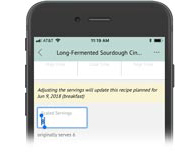 The Recipe Clipper Extension - Now available on both iOS and Android! Replacing our current mobile website with our app so you can use our app in any browser, even on your desktop. We’re excited about how these apps have come together, but they are still a work in progress. There are known technical issues that we are working through, and we’re sure that some of you will come across “bugs” that we haven’t yet found. While we would certainly like for you to leave an authentic review in the app store, if you experience an issue, instead of submitting a bad review, please email us at help@plantoeat.com with as much detail as possible so we can reproduce what you are seeing and fix the bug. This has been a labor of love with many late nights over the past two years. We’re beyond thrilled that it is finally in your hands!